Ensemble. Photo by Jenny Graham. Photo courtesy Oregon Shakespeare Festival. Over the past few years, the Oregon Shakespeare Festival has developed a pattern of taking a classic musical – perhaps one that the audience is starting to tire of – and directing it in a way so fresh and innovative that it seems new once again. In 2009, OSF’s Music Man changed Harold Hill into a man bringing Pleasantville-esque color to a black-and-white town. 2012’s Animal Crackers kept the rapid-fire Marx humor but added some cleverly blocked visual gags–and a few choice barbs aimed at the Festival itself. And this year, OSF has accomplished the impossible – breathing new life into My Fair Lady, one of the most well-known musicals of all time. My Fair Lady takes place in the streets, apartments, and racing booths of the British upper class, and director Amanda Dehnert does not try to convince the audience any different. The twist is that these settings are left to our imagination; the action takes place in a rehearsal room, where a group of actors are practicing for My Fair Lady. This setting seems cliché, but the production doesn’t skimp on technical artistry. Eliza’s final exit has to be seen to be believed, and the familiar settings become new as the rehearsal room, with the help of a few props and costumes, transforms into a myriad of settings and spaces. When I went to see My Fair Lady, an unfortunate illness was going through the ensemble, and numerous characters–including Eliza Doolittle herself–were played by understudies. Christina Acosta Robinson, coming straight from her role in The Unfortunates from earlier in the day, played Eliza immaculately, carrying her with the fire and emotional extremes the role requires to stay believable. Also great was Ken Robinson, probably the most acrobatic Freddy Eynsford-Hill in the history of the role, who drew wild applause for his rendition of “On The Street Where You Live”. The cast gave a wild, bombastic rendition of the show that made you almost forget where you were. 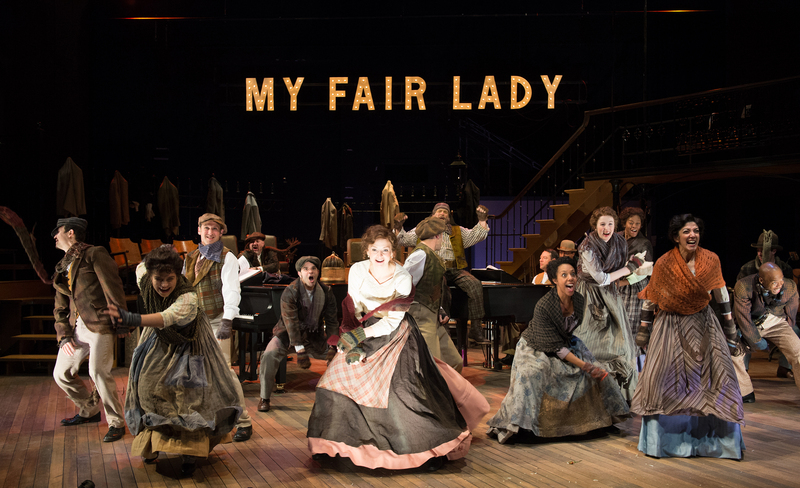 If you think you’ve seen My Fair Lady before, or even if you think you’ve seen it too many times, the Oregon Shakespeare Festival’s rendition of My Fair Lady will almost certainly change your mind. I am excited that the Festival is continuing the trend next year with The Cocoanuts, and, even more so, Into The Woods.